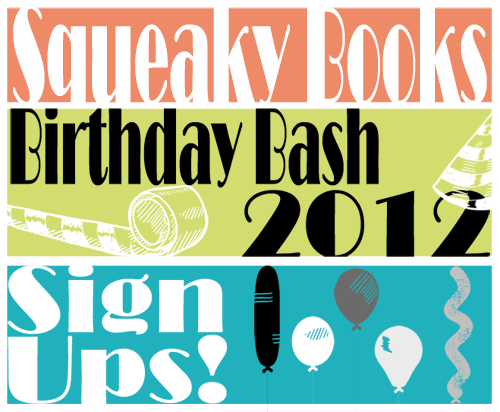 Squeaky Books: Squeaky Books Birthday Bash 2012 Sign Ups! Well, it's July. Do you know what that means? It means that it's time to start getting ready for the Squeaky Books Birthday Bash 2012! Many of you weren't here for the Squeaky Books Birthday Bash 2010 or 2011, but if you want to see all of the fun stuff we did, you can click here for 2010 and click here for 2011. I hope y'all will be interested in this. Basically all you do is host a giveaway on your blog for the birthday bash. I'll write the contest post for you (or you can write it), and all you have to do is post it at the appropriate time. This way I send my readers to discover your blog, and you send your readers to discover my blog. See how it works? Last year the people who hosted contests for the Birthday Bash gained an average of around 100 followers/subscribers/readers, and you get some major love from me personally. Contest Host Requirements: Due to the fact that there is a giveaway nearly every day during the birthday bash, I am asking that contest-hosts donate toward the cost of their book. There are three options: buy their book and mail it to me, send me an Amazon.com gift card (which is easy and anonymous), or send your book directly to whoever wins your giveaway using the Book Depository. Most books range from $10-$13. I will send you a list of books you can choose from, so you can be sure to host a contest for a book you're actually interested in. I ask that you send the book to me/send me a gift card because last year there was some problems with so many hosts mailing out the books. Things got lost. I take care of all the shipping if you choose the Amazon gift card option. If you don't want to donate you can still sign-up to host a contest, but you will only ACTUALLY host one if I can find a prize for you. This is not a guarantee. the only way to be SURE that you will host a contest is if you donate a book. 0 Response to "Squeaky Books Birthday Bash 2012 Sign Ups!"